People ask me, sometimes, how much of our playtesting do we spend testing Modern. The answer is…well, none; at least not directly. Kind-of some, but not really. Almost all of our playtesting is either Limited or Standard, but because all of our Modern cards have to go through Standard, we have a pretty good picture of how good they will be in Modern. There are cards like Treasure Cruise and Deathrite Shaman that are obviously much better in a much larger format, but that doesn't keep us from making them. Ultimately, we make the cards we believe are correct for Standard, and use our judgment to make sure we aren't doing anything crazy in Modern. Will we get it wrong from time to time? For sure. Our goal for Standard is only having to ban a card in Standard about once every ten years. It's not a zero percentage chance, but it's pretty low. We don't have any such stated goals for Modern, but we hope to get to a point where we don't need to ban cards with any regular frequency. We need to take enough risks and make both the Standard and Modern environments diverse enough that we can't be sure nothing will be broken. If we didn't, there is a pretty good chance that you all would figure the format out very quickly, and then things would get stale. We are happy to be surprised both when cards we didn't expect to make a splash do. It's also important for us to not allow the possibility of problems in Modern to totally kill Standard design space. We're not going to print anything that we believe we would have to pre-ban in Modern, but the possibility of having to ban something shortly after printing does exist—even if it is small. That being said, there are three kinds of cards that we are very careful about printing in Standard both because we don't particularly like what they do in Standard, and because we know that Modern just doesn't need any that are stronger than its current options. I've heard arguments that cards like Preordain are needed to make control work in Modern, but realistically, they would be much more powerful in combo decks than the control decks. This is one of the risks of having cheap card filtering, and one of the reasons we moved away from doing it in Standard. We print cards like Anticipate, but I don't think we will make another one-mana cantrip with card selection attached to it any time soon. It just doesn't incentivize the kinds of games we want to see play out. Part of the reason that Ponder and Preordain are banned and Sleight of Hand and Serum Visions aren't, is that the latter two are just weaker and don't do as good of a job of letting people set up their draws quickly. The problem with putting too much card filtering in a format is that it drives too many of the games to play out exactly the same. There is some novelty in this, but I think it is less fun for a format that we want to be highly re-playable. That's not to say we don't like consistency, it's one of the reasons we put so many dual lands in our sets, but there should be a reasonable tradeoff for consistency. Mana Confluence would be the best land in Standard if it didn't just have that pesky 'lose 1 life' clause on it. If you want a deck that never has color problems, then you can play mono-red. If you want to play a three-color aggressive deck, then you get to play way more powerful spells, at the cost of your life and your lands entering the battlefield tapped and messing up your curve. The scry lands, for instance, are one of my favorite land cycles we ever printed. While some players panned them initially, claiming they were way too weak, I think time has shown just how powerful card filtering is when it's not taking up a spell slot in your deck. This is, in my opinion, the good kind of card filtering. They help players play more lands in their decks, and yet still avoid getting land flooded as the game goes on. They also let people keep one or two-land hands with a much more reasonable chance of coming through, in the end, with drawing enough spells. I suspect you will see more things in the future that are individually small, but compound throughout the game to create meaningful decisions; as opposed to cards that simply allow players to quickly assemble combos. I've heard people ask questions like "Why not ban the storm cards, and unban the fast mana cards." Well, that sounds like a solution to keep storm in check, but what exactly are you planning on doing with all that fast mana? I don't think it's anything fair, exactly. I don't see people going "Turn one: Rite of Flame, Rite of Flame, Seething Song, Ainok Tracker, go." People want fast mana to do unfair things, though different unfair things than the format is currently doing. Certainly, there is a lot of fun to be had in that strategy. I've been known to belch some chars in my day, but it's not the kind of strategy we particularly like as a tier 1 strategy. Most of the super-fast combo decks in Modern that can win before turn three on a regular basis tend to do so in a way that we can expect most decks to easily interact with. I'm not saying that Infect can't get a quick win early, but that a deck with Lightning Bolts, Path, or Dismember has real game against it. It has ways to fight back. There is interaction. The deck does have 4 Empty the Warrens, so there is some storm, but that wasn't the only plan for the deck. It wanted to play either a turn-one "get 8–12 goblins," or a turn-one Deus of Calamity. Back-up plans included Blood Moon, and the ever-so-inferior Demigod of Revenge. In some sense, this deck isn't inherently unbalanced—after all, plenty of decks can deal with one of these turn-one threats after All-In-Red has, as named, gone all in; and thereby have an easy time winning the game. But it's not the sort of game play that we want to encourage in Modern. Turn one: make a huge play. If you can beat it, you win; if not, I win. I don't foresee fast mana being a thing that we take out of the game entirely—after all, it is part of red's color pie, and I think red can use all the help it can get to make sure it doesn't just devolve into burn and weenies. But we are pretty careful with the cards we print these days. I hope that over the next few years, we can create a few of these that gives red decks the ability to accelerate its mana, without just being a combo card. I'll say it—Eighth Edition is kind of a messed-up Magic set. It does a lot of things right, but boy it doesn't pull any punches when it comes to sideboard cards. When the game was younger, I think this kind of things was both more necessary (since things were far less-well balanced), and more understandable for newer players. How does my white deck beat my friend's green deck? Well, I can just bring in this Circle of Protection: Green, and then they lose! That's not to say it was the last time we pulled out the big hate guns, but I think the concentration and power of the ones in that set are pretty high. I think that having good sideboard answers is great, but especially when they are very general and go against a specific color or land type, they should be limited in their power. The cycle of hate cards in DTK is very strong, with cards like Encase in Ice and Rending Volley, but they go a long way to answer a single threat from your opponent, not invalidate their entire strategy. One of the goals of Rending Volley was to provide a powerful answer to Splinter Twin; we would be less happy if it just beat all white and blue decks for all time. 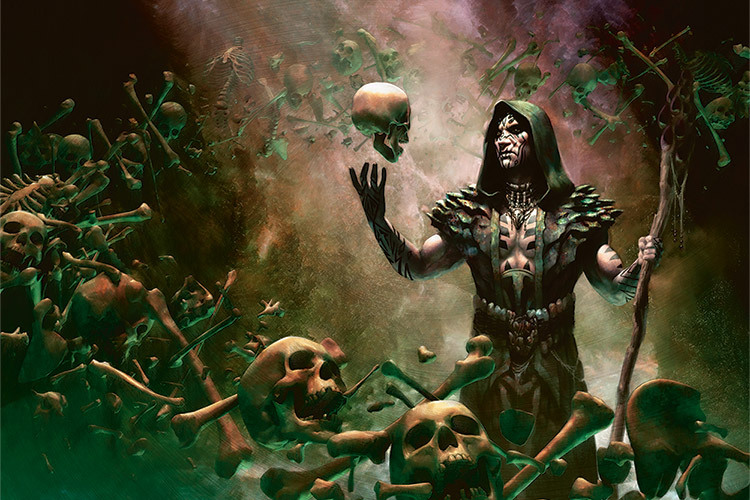 I think that reducing the number of post-sideboarded games that devolve into Dredge vs. Leyline of the Void is a good thing, but something that we only have so much control of in Modern. Many of the most powerful cards are just in the wild. We do put some safety-valves in a set that are pretty weak in the abstract, but incredibly powerful if your opponent's deck is doing something very focused. And there isn't a ton of splash damage for people that happen to play a deck that bares a mild resemblance to such decks—think Rest in Peace or Ancient Grudge. Ideally, this leaves enough space for people who want to exploit what they view as a particular hole in the metagame to make a really cool deck that other people don't have powerful sideboards against. But the Modern population as a whole can switch to more generic sideboard options to fight that, or just change what sideboard cards they use. I believe that fluctuation between "weaker but generic" answers, and "stronger but more narrow" answers goes a long way to keeping formats like Modern from becoming stale. That's it for this week. I'll be back next week with more tales of Magic's development.